Pictured above: November 2009, Maurice Gibbs, President Emeritus of the Museum; Ingrid Francis; Philip W. Read, then President of the Museum; Robbie Francis; and Jean Grimmer, then Executive Director of Egan Maritime Institute, at the Shipwreck & Lifesaving Museum. Photo by Jim Powers. During the disastrous Great Gale of 1879, numerous ships wrecked off Nantucket's western shore. Captain Thomas F. Sandsbury and his lifesaving crew fought storms, darkness, hunger, discomfort, and fatigue during their thirty-two hour rescue mission to save crews and/or passengers in peril aboard the stranded vessels. Unable to attend to all ships at once, Captain Sandsbury ordered his men to the most alarming wrecks first. After rescuing souls from both the J. W. Hall and the Emma G. Edward, Sandsbury realized the loaded lifeboat would be unable to make headway to Tuckernuck—the closest shore location. Though a difficult order to give, he instructed the lifesaving crew to row to town and the safety of Nantucket’s harbor—eleven miles away. After arriving safely, Capt. Sandsbury and his crew went to Madaket to launch another lifeboat to attempt more rescues from the ships they had been unable to attend to previously. As day broke, they reached the schooner Emma and performed their final rescue. The youngest member of Captain Sandsbury’s crew was 19-yearsold Marcus W. Dunham, but let it be clear this was not Dunham’s first rescue. Indeed, at the age of 19 he was already a skilled lifesaver with a stockpile of stories and dangerous dramas to tell. Dunham received his first lifesaving award from the Humane Society in 1876, when he was only 17-yearsold. Two years later in 1878 he received his second. His exhaustive efforts under the leadership of Capt. Sandsbury to rescue crews from three vessels caught in the roaring Great Gale of 1879 earned Dunham his third award. Marcus W. Dunham's Congressional Medal. 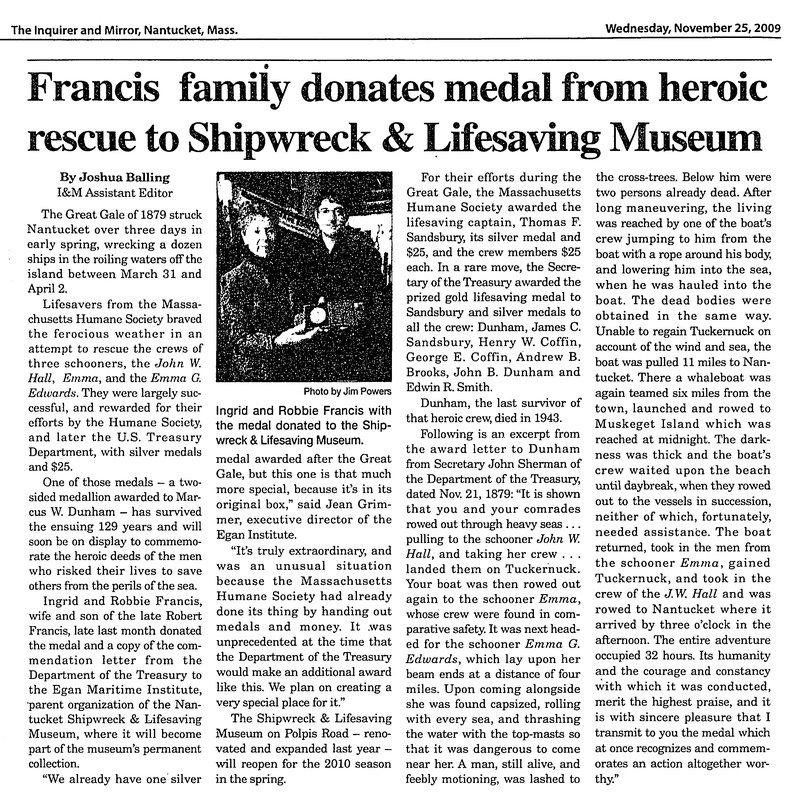 In 2009 Ingrid Francis and her son, Robbie Francis, gifted Dunham’s Congressional silver medal from the United States Department of the Treasury for his Great Gale rescue to the Nantucket Shipwreck & Lifesaving Museum. It is a vital part of the museum’s permanent collection and a relic of rescue and valor for Nantucket. Nearly a decade later, the generosity of the Francis family continues to inspire Museum visitors by sharing Dunham’s courage, bravery and the heroic stories of his rescues. The Great Gale of 1879 was a horrific event. Lives were lost, but lives were also saved. Dunham’s medal is a reminder to all who visit the museum that the unified efforts of few can save the lives of many—a wonderful testament to the character of Nantucket.